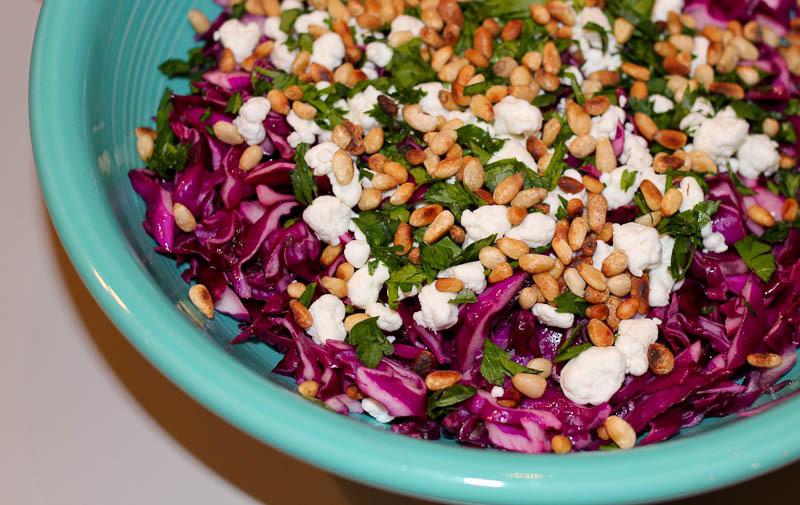 If you have made the Roasted Root Vegetables and have leftover goat cheese and parsley, then try this red cabbage salad. Dress with olive oil and lemon juice. Season with salt. Top with goat cheese, pine nuts and parsley. Add chicken and serve as a main course or filling lunch. Substitute goat cheese with feta cheese or fresh cheese. Substitute pine nuts with other seeds eg. sesame or sunflower seeds. Substitute parsley with cilantro or other fresh herbs. This entry was posted in Salads & sides, Veggies only and tagged cooking, dinner, healthy food blog, recipes, red cabbage, rødkål, side dish, vegetarian, winter. Bookmark the permalink. Det ser lækkert ud – vi spiser rigtig meget rødkål! Har nu set din søde kommentar om din baggrund. Hvor meget er 1 OZ ? Thank you. It’s good the day after too. 1 oz is 28 gr.